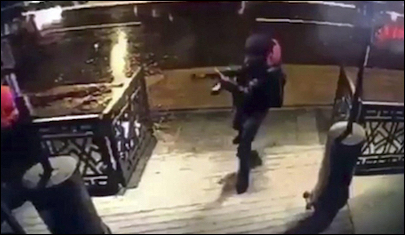 A video still from a security camera shows an ISIS terrorist entering the Reina nightclub in Istanbul to commit what one Turkish analyst called a "lifestyle massacre." Last year was no doubt an annus horribilis for Turkey. President Recep Tayyip Erdogan said that 1,178 people were killed between July 2015 and December 2016 in Turkey's fight with the Kurdistan Workers' Party (PKK). Bomb attacks by the Islamic State (ISIS) claimed another 330 lives. Those numbers exclude 248 people who died during the bloody coup attempt of July 15, as well as 9,500 apparent PKK members who were killed by Turkish security forces. Turkey also claims that it killed 1,800 ISIS members since July 2015. These numbers put the total death toll in Turkey at 13,056, in a span of fewer than 17 months. Just when most people thought that would be the final death toll for 2016, on December 10, a twin bombing in Istanbul outside a soccer stadium killed at least 38 people, and injured another 136. A week later, a suicide car-bomb in central Turkey killed 13 off-duty soldiers aboard a bus and wounded 56 more. After so much bloodshed, Turks thought they could now enjoy New Year's festivities in peace. They were wrong. About an hour into the New Year, a mysterious man, later identified as a Kyrgyz ISIS terrorist, walked into Reina, a posh nightclub on the Bosporus, took out an assault rifle and started to shoot at the hundreds of guests celebrating the New Year. The assailant killed 39 people and injured 65, changed his clothes, and, pretending to be a customer, walked out of the club. As of January 8, the killer was still on the run. ISIS terror attacks are no more than violent expressions of the dominant Islamist ideology ruling in Turkey. The attack at Reina was ISIS's 15th major act of violence in Turkey since 2014, but its first targeting a nightclub. There was, in fact, a "sociology" behind the jihadists' choice of target. ISIS clearly wanted to send various messages at many wavelengths. One was to tell "infidel" Turks that they should not celebrate the New Year; another was to tell conservative Muslim Turks that ISIS was on their side. Actually, ISIS's terror attack was no more than a violent expression of the dominant Islamist ideology ruling in Turkey. About 10 days before ISIS's attack, Turkish authorities banned teachers and pupils at Istanbul Lisesi, an elite school in Istanbul that is partly funded by Germany, from singing carols or celebrating Christmas in any way. German teachers at the school received an email from the headmaster early in December, informing them of the new rules. Around the same time, a soap opera broadcast on Samanyolu TV, a conservative Muslim station, featured Santa Claus as a "terrorist." Meanwhile, Turkey's top religious authority, the prime ministry's General Directorate of Religious Affairs (Diyanet), declared at Friday prayer sermons that New Year celebrations were religiously "illegitimate." Elsewhere in Turkey, banners were unfurled, showing a bearded man punching Santa Claus; another banner showed a group pointing guns in the face of another Santa. On December 31, a headline in an Islamist newspaper read, "This is our last warning, DO NOT celebrate." Taha Akyol, a prominent Turkish columnist, calls ISIS's latest attack "a lifestyle massacre." He wrote: "Innocent people who were having fun were massacred because of their lifestyle." He reminds that about 8% of Turks sympathize with ISIS. That makes nearly 6.5 million people. ISIS's attack on Reina was a salute to those millions of Turks who admit their sympathy for ISIS, and millions of others who hide their sympathy. Aysegul Basar, detained for giving a speech advocating secularism at an Istanbul tea house. With its increasing vulnerability to jihadist terror and with a homegrown jihadist ideology that provides a safe haven for terror, Turkey is becoming like Iraq, where violence takes lives almost daily. ISIS's first act of terror targeting Christmas celebrations took place on December 25, 2013, when the radical group killed 38 Christians in Baghdad. Three years later, ISIS visited New Year's celebrations in Istanbul. Where, you might ask, are the Turkish authorities? They are busy. 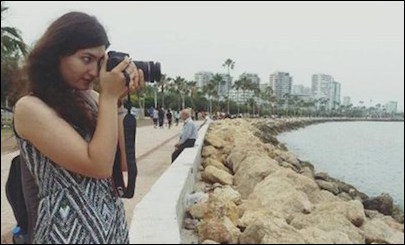 The Turkish police, unable to prevent ISIS's attack, instead detained a woman in Istanbul who called for secularism in a speech protesting jihadist groups. Aysegul Basar, a leftist, was detained after her speech, given at an Istanbul teahouse, emerged on social media. "We say 'enough!' From now on we won't allow ISIL or any reactionary jihadist group into our neighborhoods," Basar had said. From a law enforcement point of view, Istanbul is safer for an ISIS gunman than for someone who pledges to fight jihadists.